How to add and remove emails in your address book. 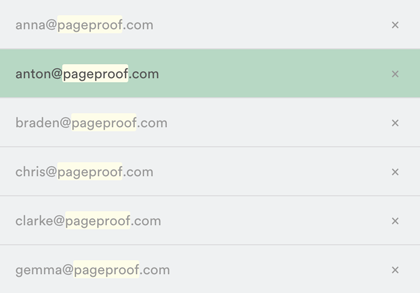 When you add the email addresses of people to your proofs, PageProof will start to remember them and suggest a list of potential emails that match when you next start typing an email address. Simply add someone to a proof. The email address will be remembered for next time. Next to the email suggestion, click the small x. This will remove it from the address book.